“A Mutant Vehicle is a unique, motorized creation that shows little or no resemblance to their original form, or to any standard street vehicle. Mutant Vehicles are radically, stunningly, (usually) permanently, and safely modified from their base vehicle. Sometimes the whole vehicle is made from scratch. 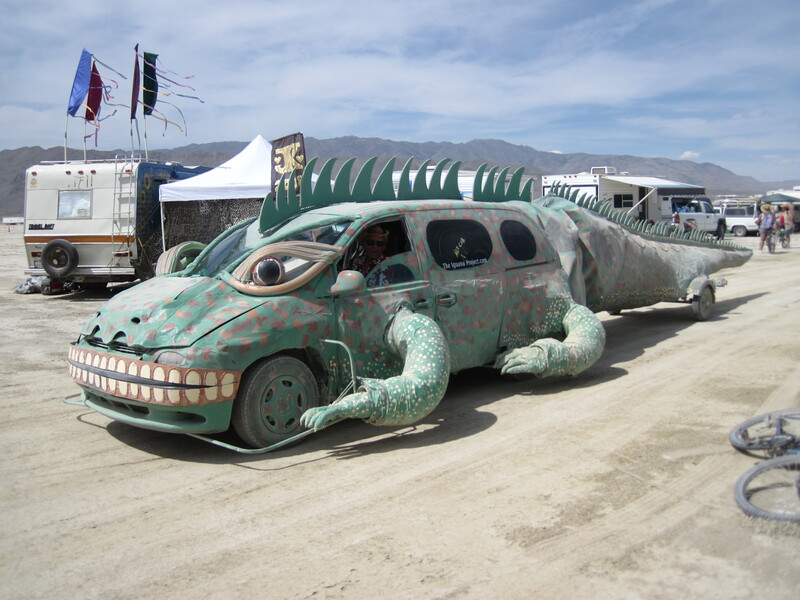 Mutant Vehicles may include such non-standard motorized forms such as furniture, other non-street vehicles such as a boat or train, animals, or just about anything imaginable.” —Taken from Burning Man’s website. 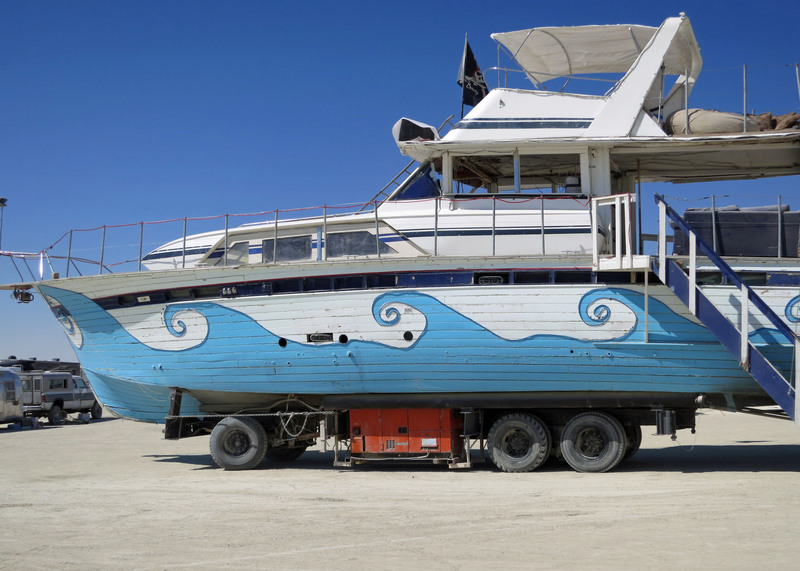 Burning Man takes its mutant vehicles seriously— partially because they are an integral part of the Burning Man experience and partially because safety is a critical issue. These often-large vehicles must maneuver through and around thousands of bicyclists and pedestrians both during the day and at night. 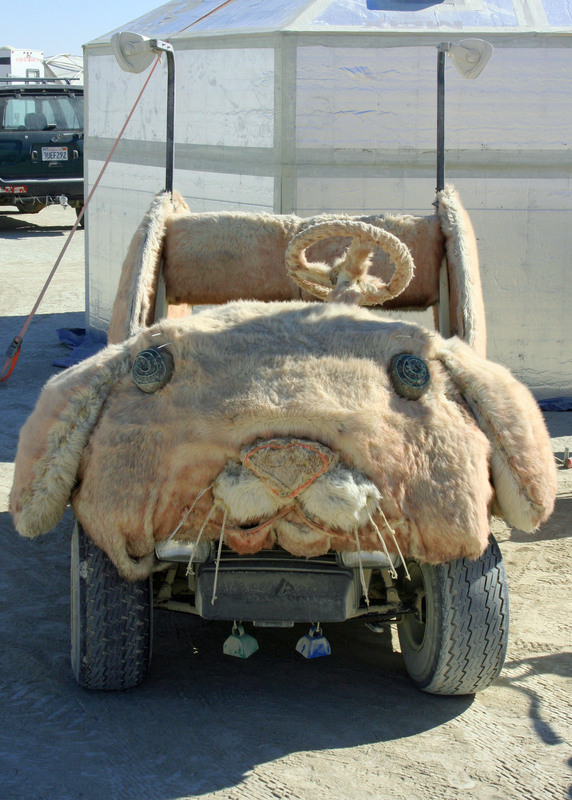 The Department of Mutant Vehicles is responsible for overseeing the permitting, inspection and operation of Mutant Vehicles at Burning Man. Headquarters! 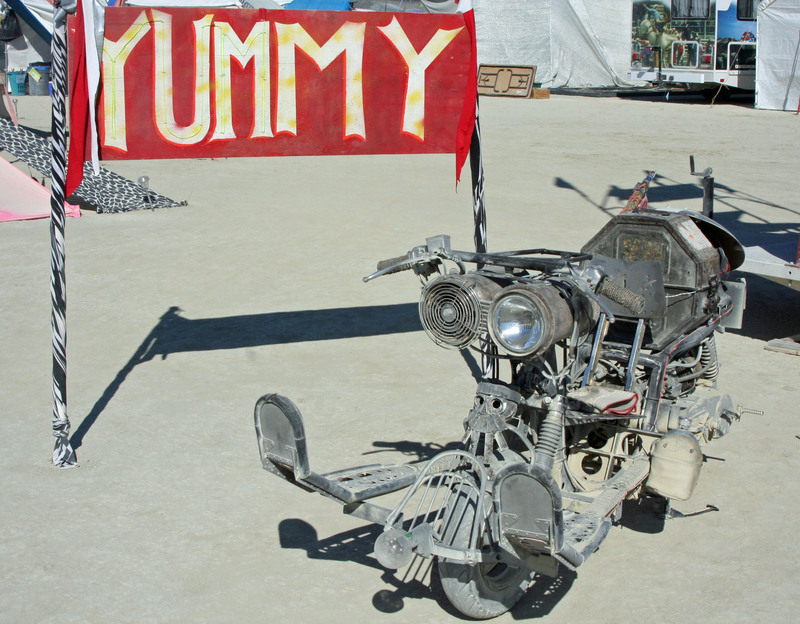 All mutant vehicles must stop here to pick up their licenses to operate at Burning Man and have a safety inspection. A covered wagon had us running for our cameras. I’d say that there was a ‘wow’ factor. Another view. The Black Rock Desert would have seen similar vehicles (albeit smaller and attached to oxen) in the 1860s along the Applegate cutoff to the Oregon Trail that ran through the area. This photo was taken in front to our camp. 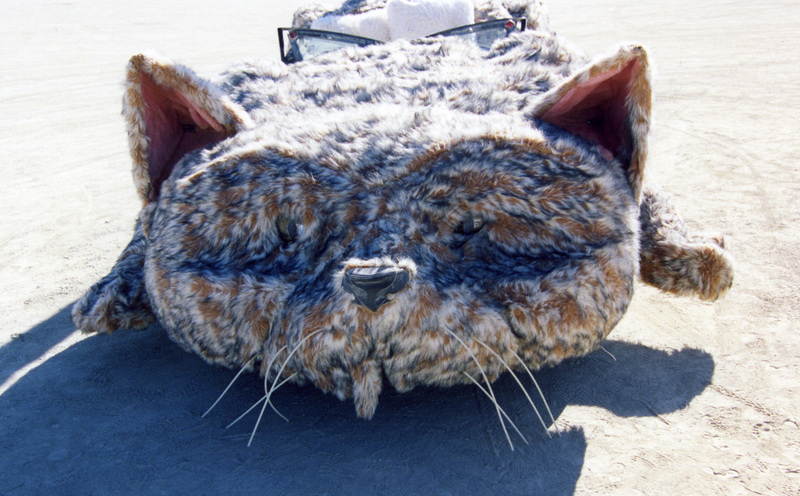 The cat car is another perennial favorite of mine at Burning Man that has a definite ‘wow’ factor. A side view. 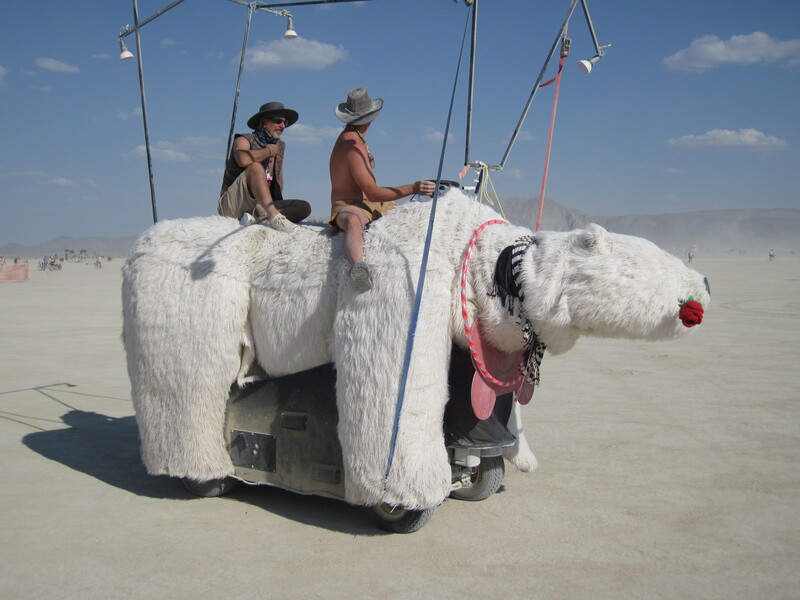 It takes a lot of guts to have pure white upholstery at Burning Man! And a close up of the kitty’s head. Interactivity is also considered critical. Giving rides to Burners and providing entertainment are two ways of accomplishing this. 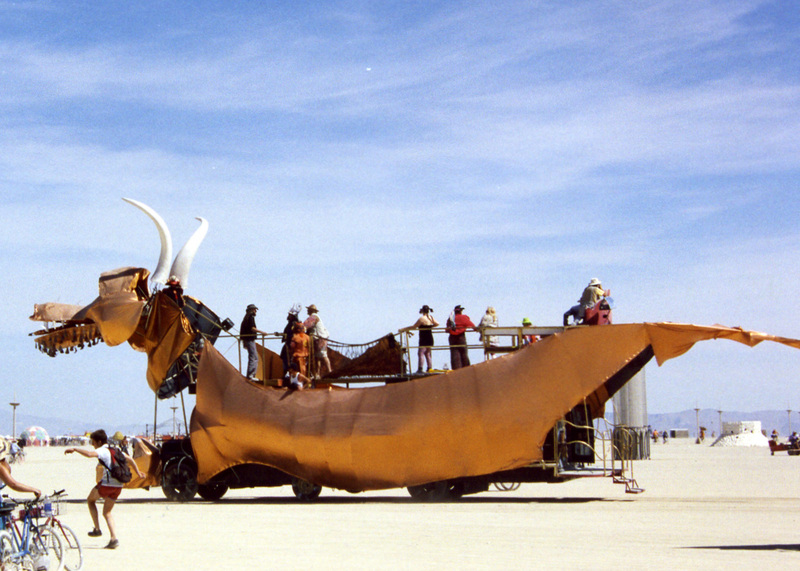 For example, one year I saw a fire-breathing mutant vehicle that featured an opera singer standing on top. When she hit her high notes, the vehicle would send flames shooting into the air. Safety involves many of the things you would expect including good brakes and safe accommodations for passengers. 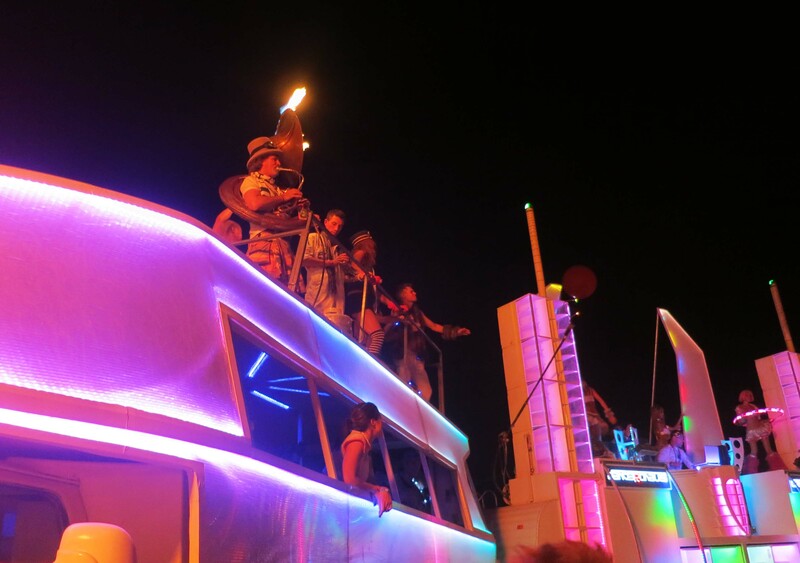 Think of 40 people (some who have spent a fair amount of time visiting Burning Man’s free bars) dancing on top of a vehicle as it drives through the desert night. Falling off is a real possibility. Railings are critical. There are serious railings on this orange bus mutant vehicle. Note the intricate carving of the wood. A side view of the bus. I suspect one would land with quite a bump coming off the slide. This guy with his boxer-beak and tail feathers also has a well-built railing. Vehicles that want to travel at night must have adequate lighting on all sides of the vehicle. But the requirements go further. Lighting is also expected to contribute to the “wow” factor. Many mutant vehicles are more spectacular at night than they are during the day. One of my all-time favorites is a large, travelling vase. This large vase mutant vehicle normally lives in camp during the day. Another day-time shot. This one with a mountain backdrop. The vase at night. Mutant vehicles form a large circle around the Man on Saturday night when he is burned. The flower is part of another mutant vehicle. A different views with different colors. I caught this shot as the vase left a wedding in Black Rock City. As you might imagine, vehicles that feature fire art and shoot flames into the air, must also meet strict requirements. The types of tanks, fuel lines, daily safety checks, and emergency shut off valves are all included. But the effort is worth the extra care when you consider the results. 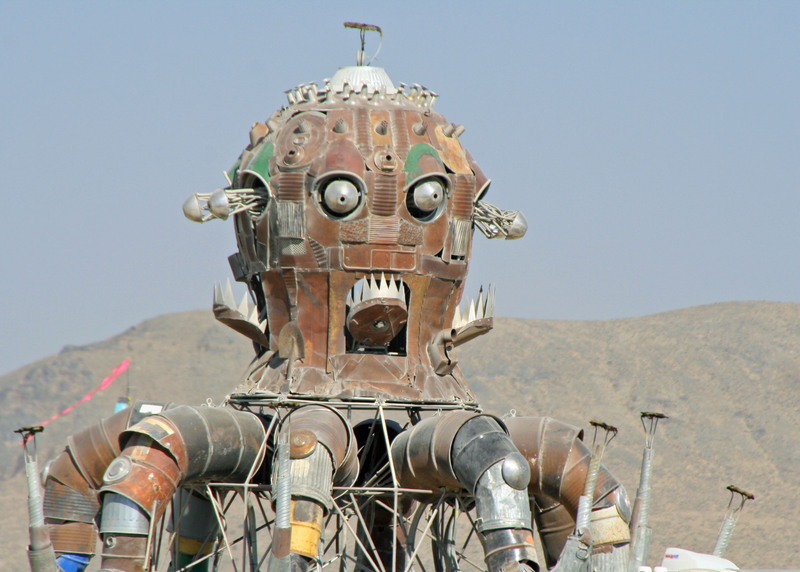 Imagine meeting up with El Pulpo Mechanico as it roams across the playa with all eight arms flaming. 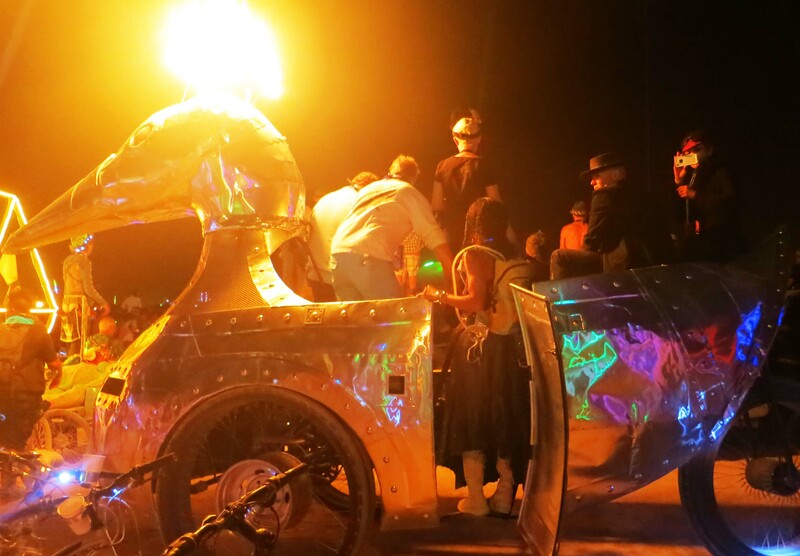 El Pulpo Mechanical as he flames his way through the Burning Man night. The ‘weapon’ on top of this Mad-Max look-a-like shoots flames as well. And finally, there are sound requirements. 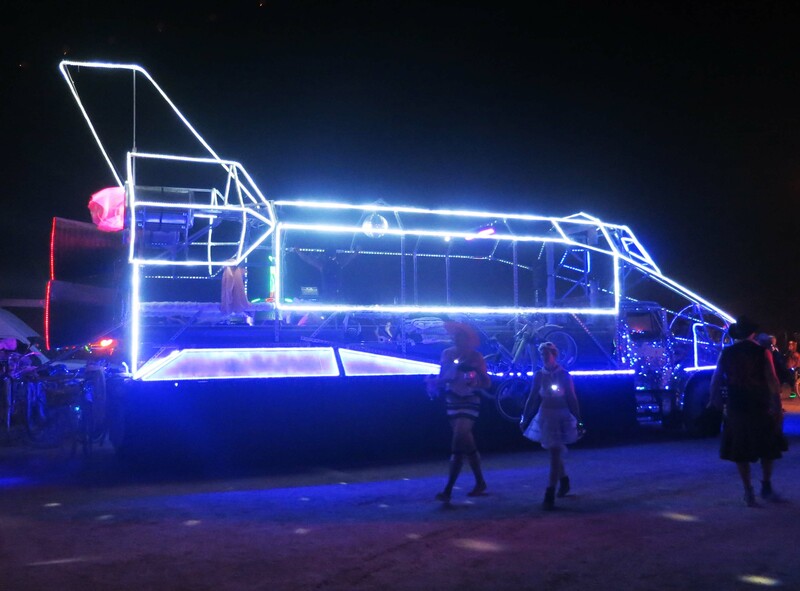 Nothing is more irritating than a mutant vehicle with humongous speakers making its way through your neighborhood in Black Rock City while blasting out music at 2:00 AM. 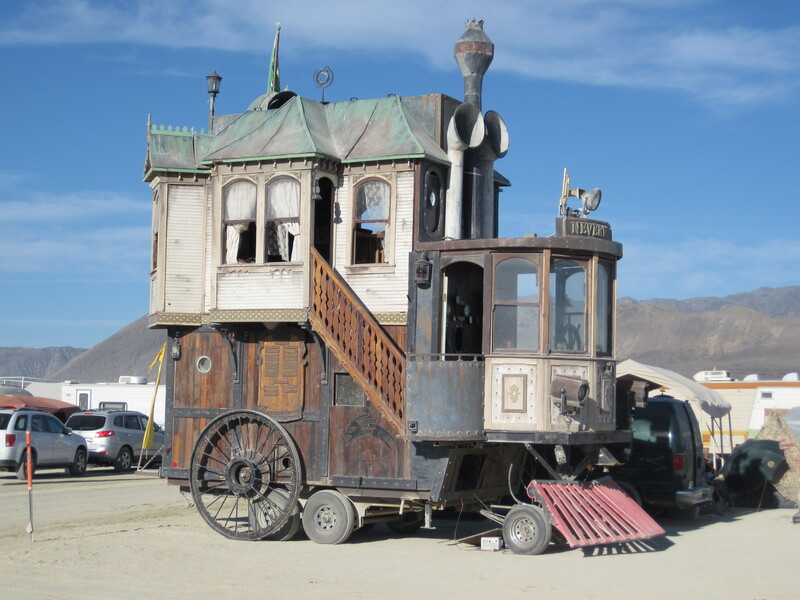 Burning Man notes that there has been an “increase in the number of vehicles with sound systems that would normally be designed for an arena or stadium.” No kidding. Having those systems pointing at you is like deaf city. Fortunately, the loudest systems tend to be restricted to the outer areas of the city where Burners can go deaf to their hearts-content. Check out the number of speakers on this mutant vehicle! They are the reason it is assigned a position way out at the edge of Black Rock City in the Playa. 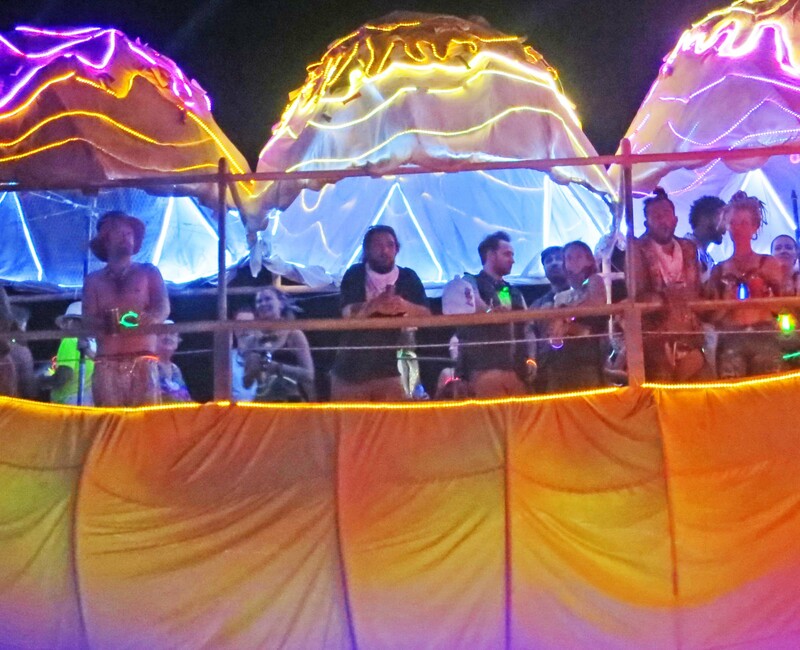 There is almost always a crowd of people dancing around and on this vehicle, including up on the heart. And just for fun, I will close today with this googly-eyed, low-tech frog. Monday: The airplane that crash landed on the Hudson River in New York City. Wednesday: The Sierra Trek— Our second day included a sixteen mile hike without any water sources, a lost trekker, and a huge timber rattlesnake that insisted on blocking the trail. 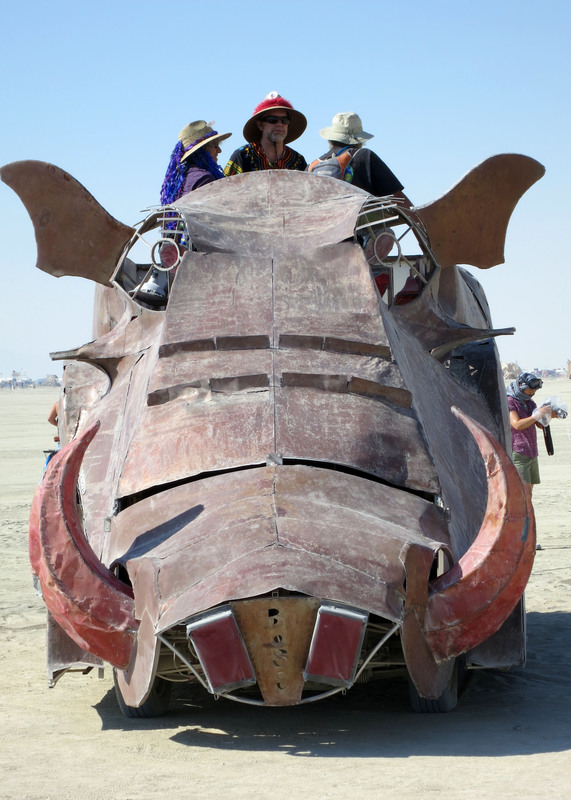 Friday: More Burning Man mutant vehicles including El Pulpo Mechanico and a huge Rhino that would send his African counterparts scurrying for cover. If Donald Trump had stared out his window and seen this fellow staring back, do you think it would have changed history? 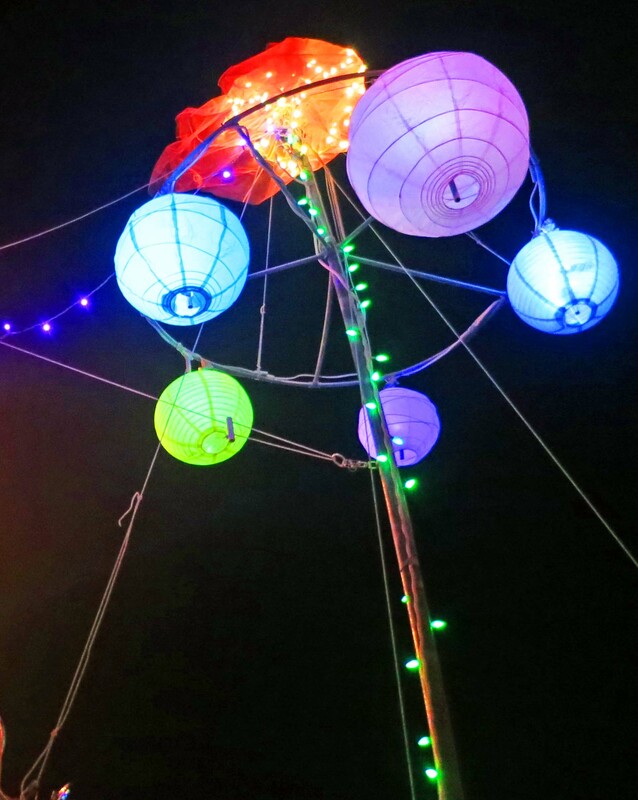 Today I am kicking off my Friday photo-essay series on Burning Man. Last week I went through the thousands of photos I have taken since I first went in 2004 and winnowed them down to a mere 4,000. (grin) I suspect you will see a few hundred of them on Fridays over the next six months leading up to the event. I had a long discussion with myself over what to start this series with. “What are you talking to yourself about?” Peggy had asked worriedly. Mutant Vehicles won out. 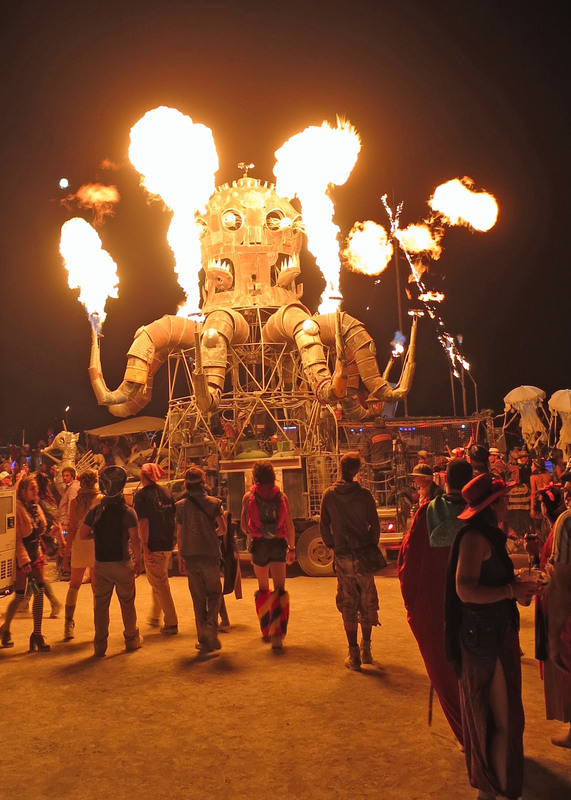 I love the variety: from dragons to bugs to ships to rhinos to cats to Mad Max wannabes— Burning Man has them all! Peggy and I share photo taking responsibilities at Burning Man but we also have help from fellow members of the Horse Bone Tribe: Don Green, Tom Lovering and Ken Lake. I’ll try to credit Don, Tom and Ken, but if I miss a few, my apologies. 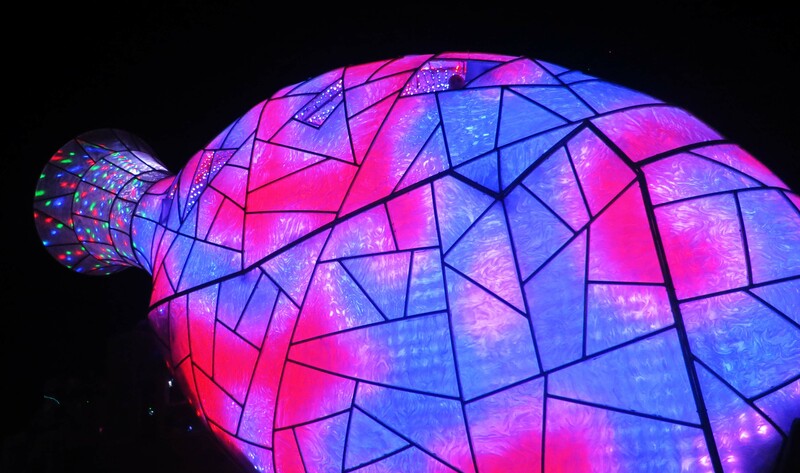 Let’s start with Abraxas, a 60-foot dragon equipped with a 10,000-watt sound system. Normally, Abraxas hangs out at Burning Man, but on November 11 (right after the election) he was in Washington DC on the Mall. I wonder if the new president looked out his window and saw him. Probably not. There weren’t any tweets. What would Trump have tweeted about Abraxas? Any ideas? 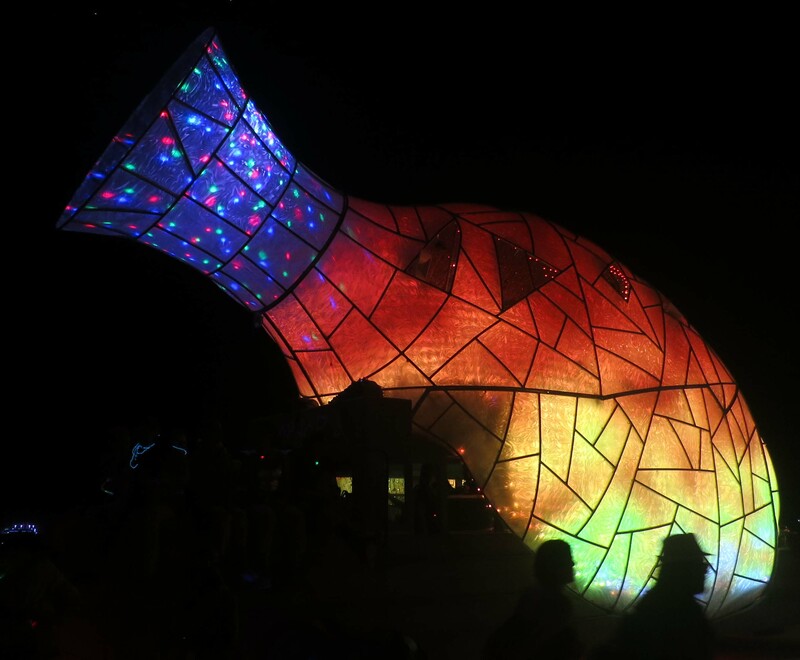 Abraxas has been going to Burning Man for a number of years. In 2016, he showed up with a baby. 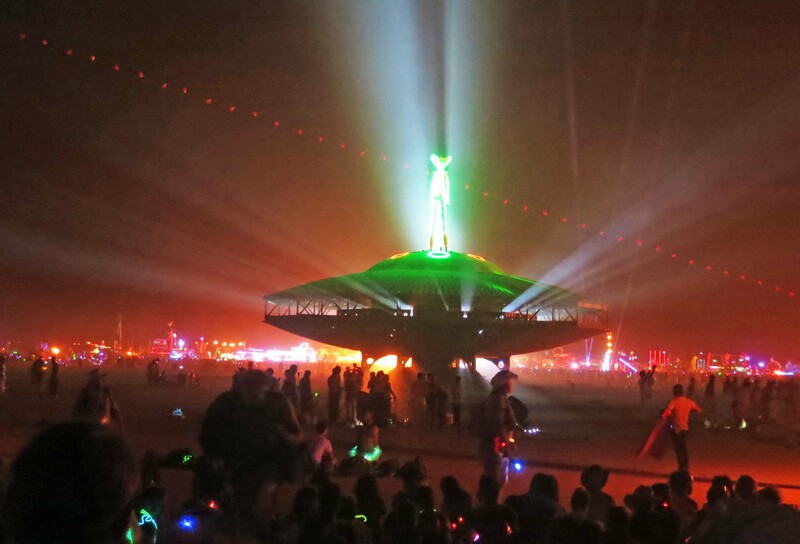 Early in the morning before sunrise, Abraxas likes to hang out at the Temple, you can see him lurking out on the Playa. When the sun comes up, it is time to dance, however, and he fires up his 10,000 watt speakers as Burners gather around. Another close-up of Abraxas. The tube coming out of his mouth spits out fire at night. 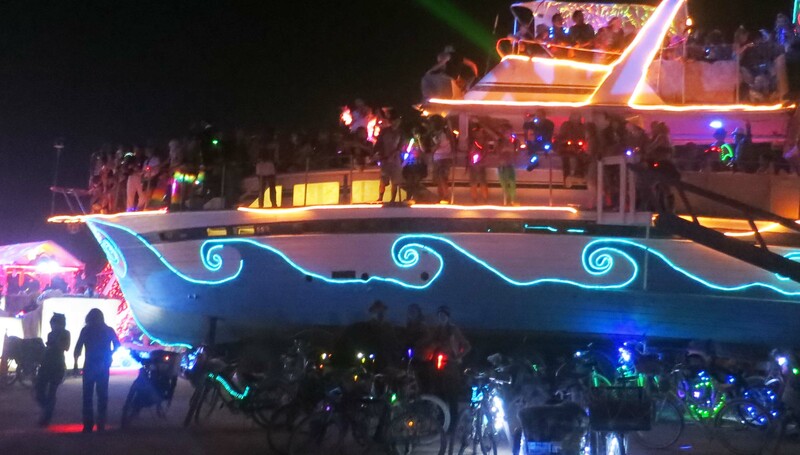 Mutant vehicles at Burning Man take on a different look/personality at night. Here, Abraxas was getting ready to go out and party the night away. You may have noted the different faces. 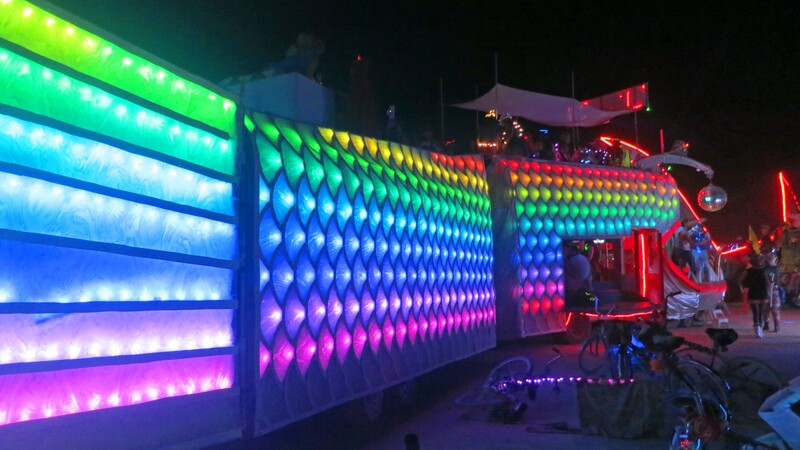 Most years, Abraxas comes back to Burning Man with a new look. 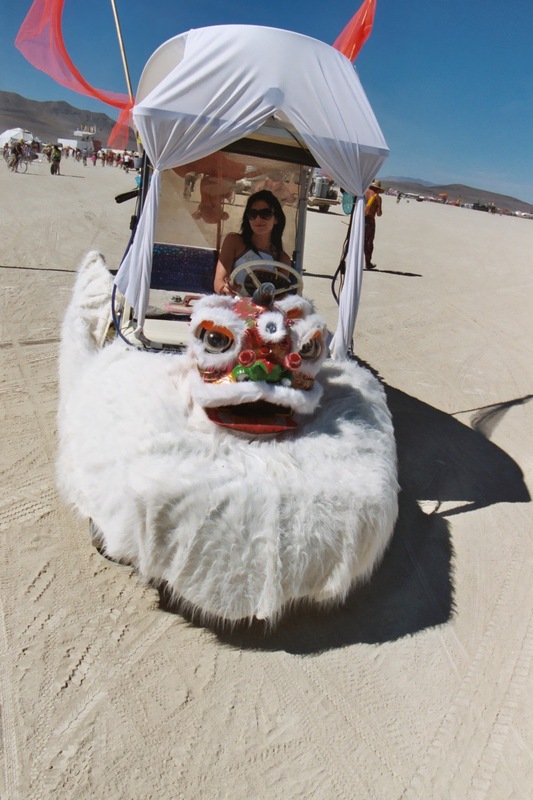 The golden dragon is one of hundreds of mutant vehicles/art cars found at Burning Man each year. While you are required to park your car, truck, RV, etc. 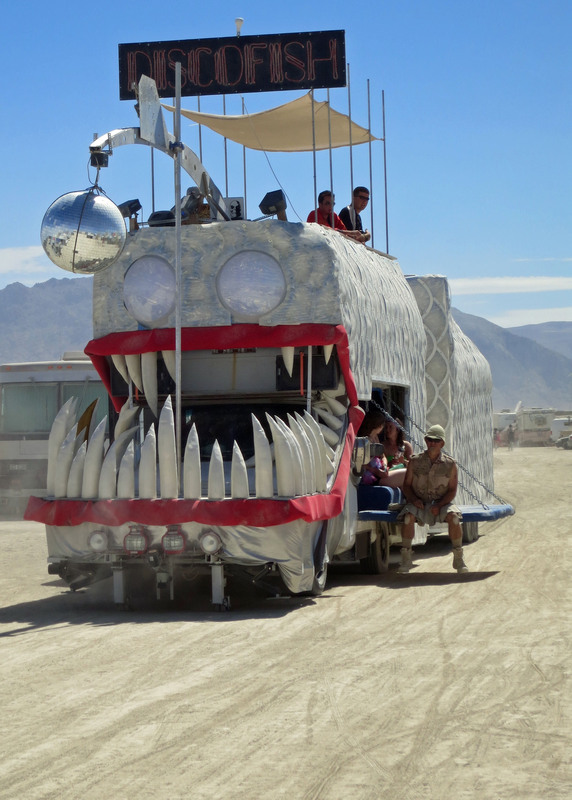 at your camp and leave it parked, mutant vehicles are free to roam the playa and Black Rock City, assuming they have a permit. Today I am going to also feature a warthog, a lion, an angler fish, a lizard dragon, a mammoth and traveling bar. There will be more next Friday! This warthog is a favorite of mine. Head on! Check out the tusks. And a side view. I think he is kind of cute. I once followed a warthog and her kids across the Serengeti Plains in Africa. Mom and kids all had their tails sticking straight up in the air. A side view of M.O.J.P., which I assume is a lion. Note the big mouth. My friend Tom Lovering found it quite comfortable. M.O.J.P., BTW, was once an RV. 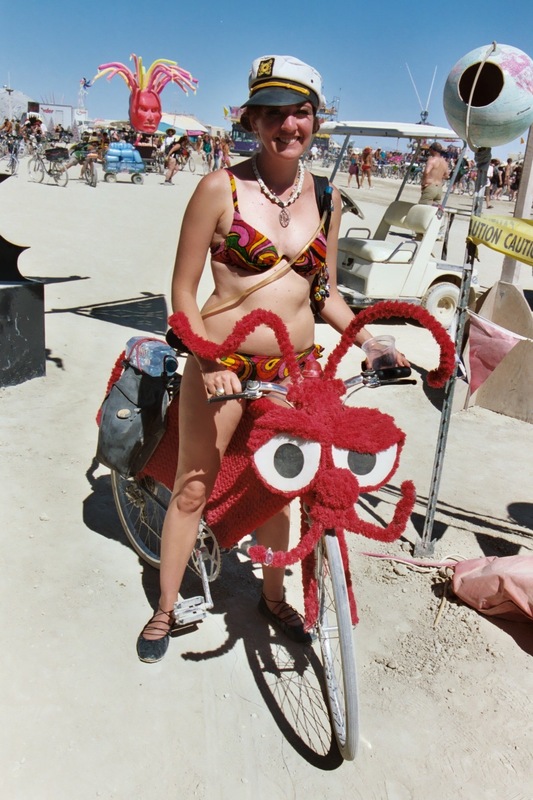 Peggy found this small but ferocious looking dragon out on the Playa and climbed aboard. Fortunately it was missing keys. Otherwise I still might be searching for her. 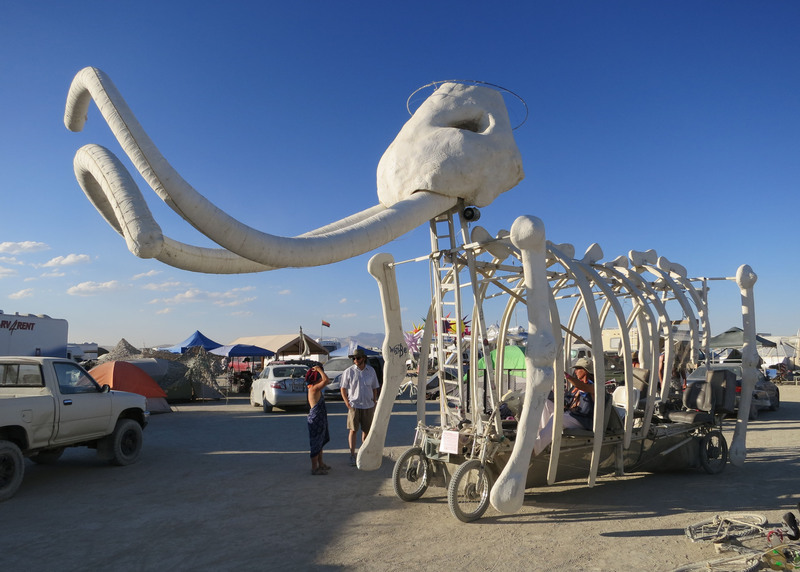 Somebody had a twisted sense of humor when it came to creating this Mammoth art car. A side view of the mammoth’s head and tusks. I wonder if the wire around the head is supposed to be a halo? A full view of the mammoth. Whoa! If I didn’t have a clue about what was happening and saw this creature drifting by in a dust storm, I would be looking for the nearest exit. Here’s the angler fish up close and personal. In nature, angler fish use the nose dangly as bait for attracting prey. Great teeth. How the fish might look just before it chomped down on you. This tractor pulls the bar around. Action at the bar! Tom and I stopped for a taste of moonshine. It was potent stuff! Peggy walked through the bar’s door and came out in this kitchen! Monday: I’ll conclude my Boston series. 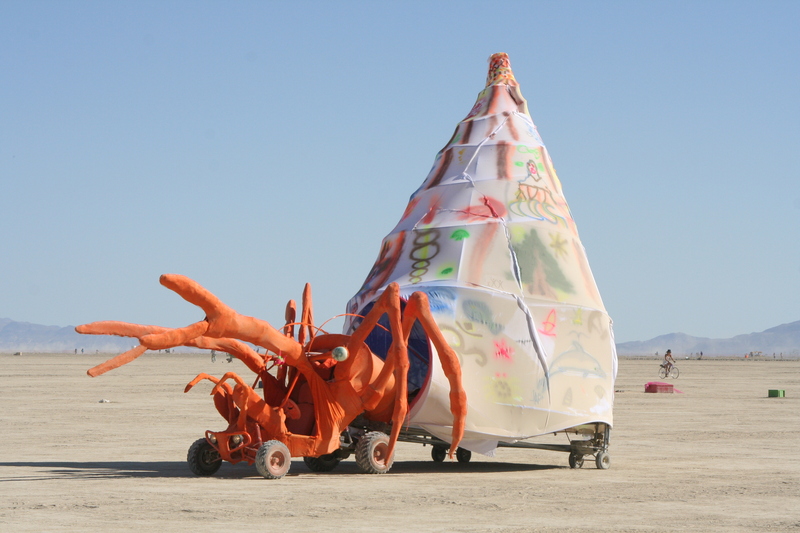 Friday: My next post on the mutant vehicles of Burning Man. Walter the Giant VW Bus zips across the Playa at 5 MPH with his flag flying proudly. In another life, he was a fire truck. Having owned and wandered in a 1976 VW Camper Van from 1976 to 1983, I felt an immediate attachment to Walter, the giant VW Bus. I decided to look into his past. 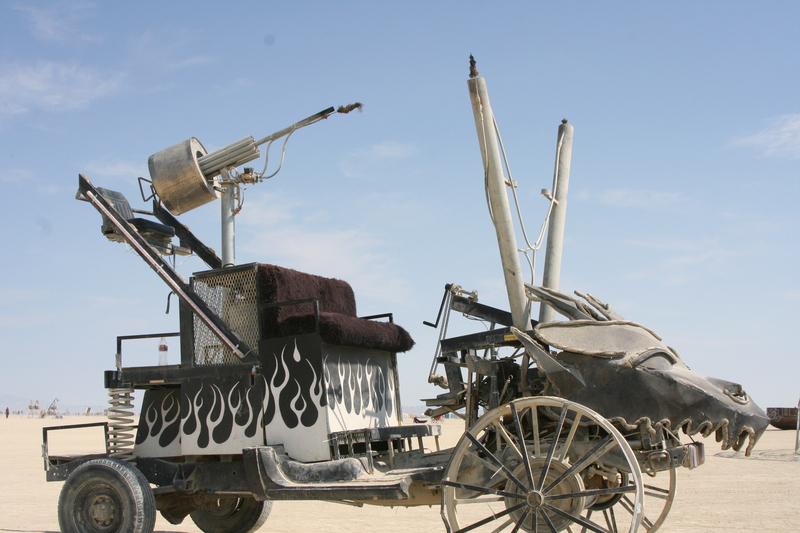 Most of Burning Man’s Mutant Vehicles have lived full and meaningful lives by the time they make it to Black Rock City. Walter, it turns out, started life in 1963 as a Walter Crash Truck at Luke Air Force Base in Arizona. He took his name from the Company. The Crash came from the fact that he was supposed to show up at an airplane crash site before anyone else and spray flame retardant on the highly volatile jet fuel. It was “BOOM” and kiss your hose goodbye if he failed. Beyond that there was a lot of sitting around and waiting. That’s the life of an airport fire truck. Next, Walter made his way to a less dramatic but still important role with the New River Fire Department north of Phoenix. From there he retired to the Gold King Ghost Mine just outside of Jerome, Arizona as an antique to be admired. 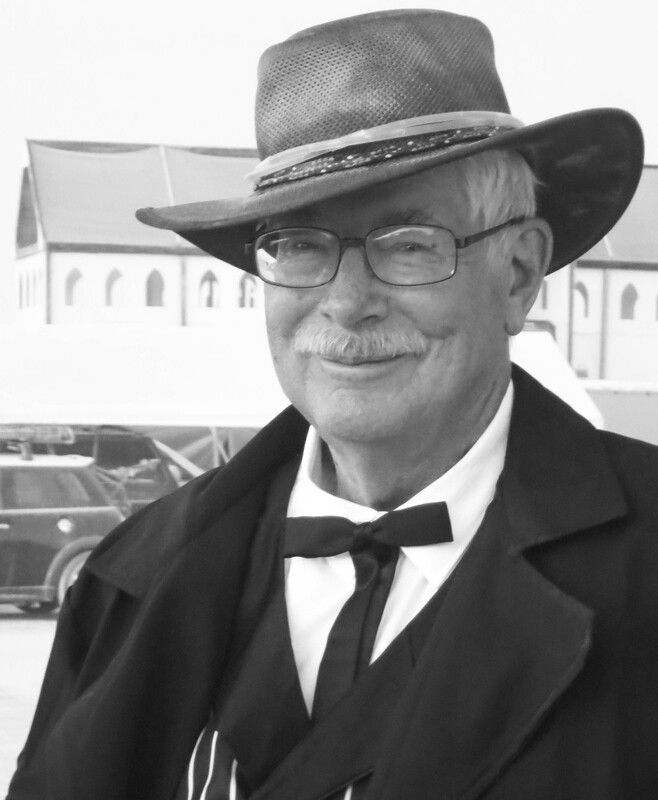 Don Robertson, the owner of the mine, likes old things and, judging from photos, is something of an antique himself. Walter would have been happy to spend his retirement years rusting away there— and he would have except for one of those strange quirks of fate. Numerous vintage VW Buses make their way up the mountain annually to the Jerome Jamboree and camp out at the ghost mine. 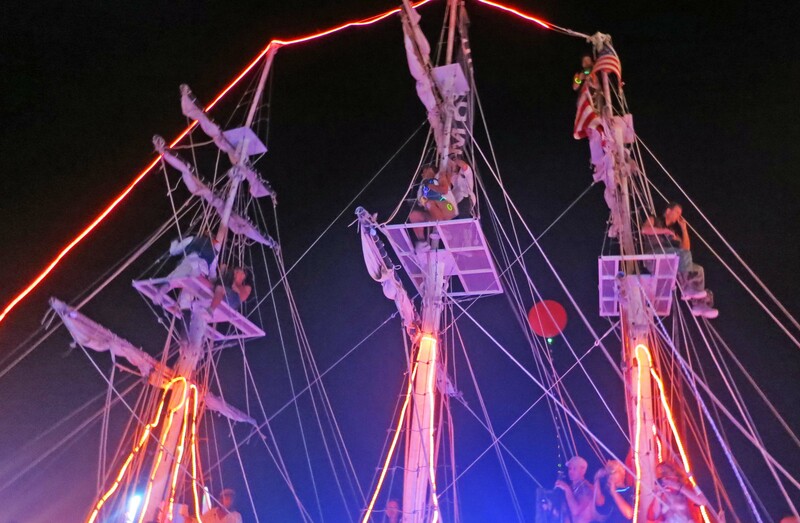 Kirk Strawn, who was among the participants in 2003, had just read an article on Burning Man. He saw Walter and fell in love. He didn’t see an aging fire truck; he saw a giant VW Bus. Walter was about to be reborn. Kirk traded a 1979 VW Camper for Walter and moved him to an old lumberyard in Scottsdale where a crew of dedicated volunteers, Tribe Walter, began the transformation process. 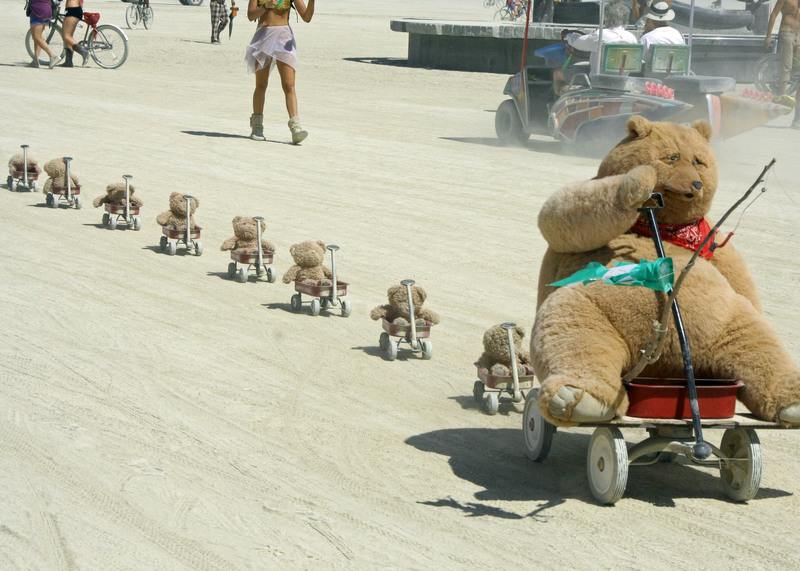 Six years later, Walter made his first trip to Burning Man, and according to all reports, loved the event. For those of you who crave details: Walter is 30 feet long, 13 feet tall, and weighs 19,500 pounds. He has a 330-gallon water tank for an on board misting system. 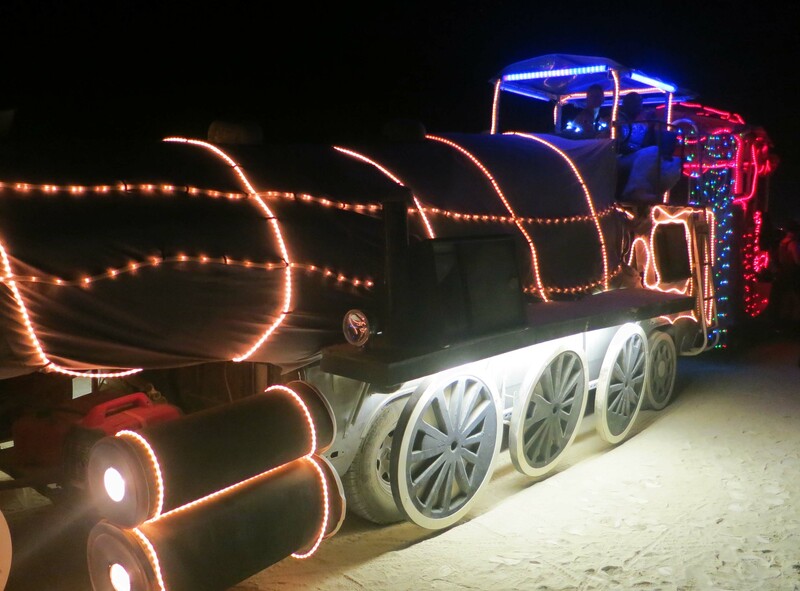 His nights are lit up by some 10,000 plus LED lights. You can learn more about this interesting Mutant Vehicle at Walter the Bus. Walter lit up with his LED lights. 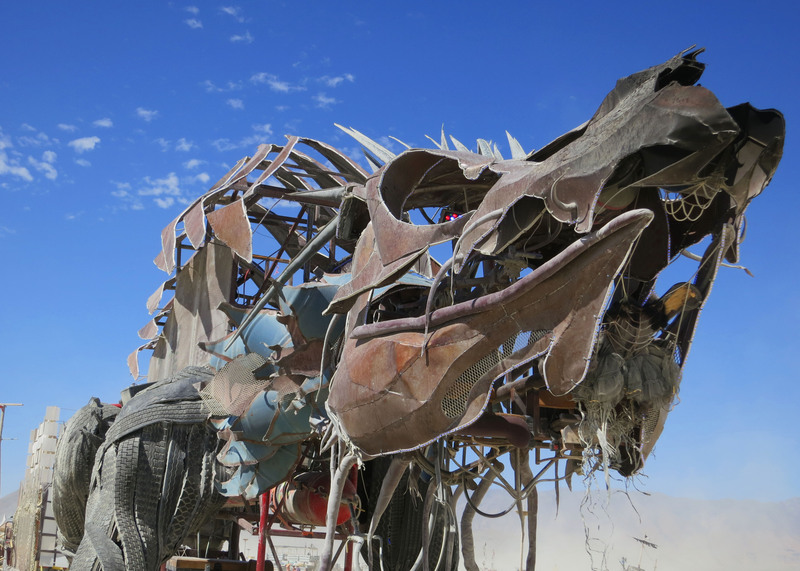 Altogether, there were close to a thousand applications for Mutant Vehicles at Burning Man in 2015. 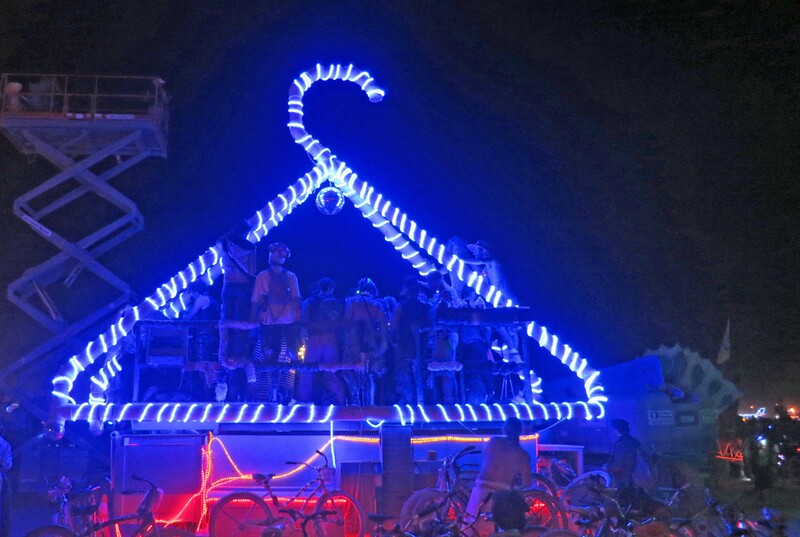 It was too many for the event and the Burning Man Organization, BMO, limited the number of permits to 600. I agree with the decision. Biking and walking take precedence. Still, I can’t help but wonder what wondrous creations didn’t make the cut. On the other hand, I didn’t have time to even start to appreciate all of the vehicles that were there. Here are a few more before I move on to my next topic: There was an old woman who lived in a shoe, and other Burning Man sculptures. I’d get off the track for this giant train engine. What’s a train without a caboose? How about a kiss? Come on, you know you love me. The fish in front has a big problem. The fish at night. Still dodging his toothy pursuer. I decided this “Mad Max” vehicle deserved a World War II black and white photo look. Giant bug. 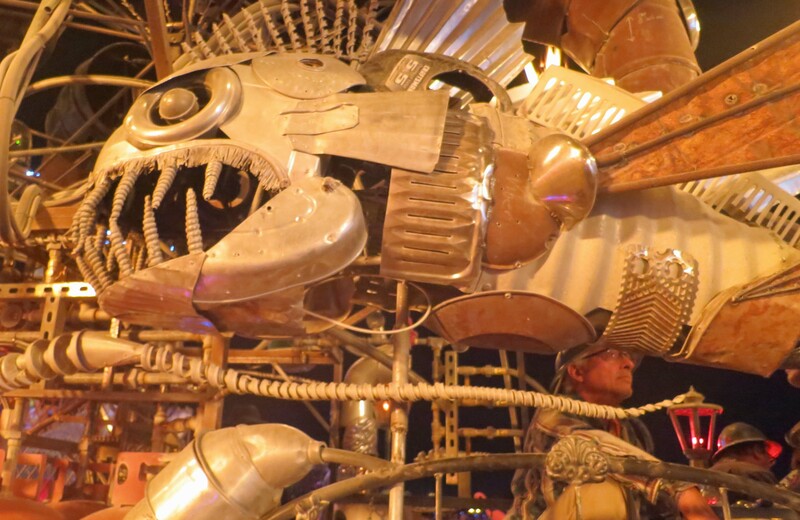 Big teeth have always been “in” at Burning Man. I decided this is a cow but I could be wrong. Her herder is walking along beside. Modern art in an urban setting. Thousands of Burners gather in the Playa the night the Man is burned in what is both a huge party and a symbolic celebration. Burners arriving early get prime seats in the dirt while volunteers and staff make final preparations for the burn. The Man stands (looking alien) on top of his flying saucer, arms down. Mutant vehicles can be seen in the distance. A string of helium balloons stretches across the sky. 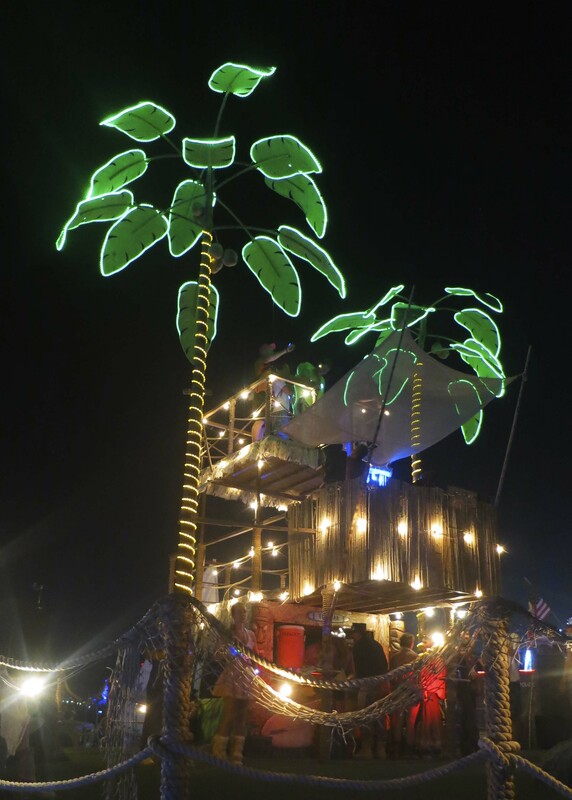 They gather in the tens of thousands, trekking out from their temporary homes in Black Rock City to an event viewed by some as the world’s greatest party and others as a celebration– a final goodbye to the tall, wooden man who serves as a magnet by day and a beacon by night. Burners arrive on foot, bike, and mutant vehicles, forming concentric circles around the Man: an inner circle of fire dancers, a second circle of sitting and standing Burners who settle in for the show, a third circle that serves as both a promenade and the world’s largest dance floor, and a fourth circle dominated by huge mutant vehicles that throb with music, shoot fire into the air, and provide convenient viewing stands for various theme camps. The burning of the Man is sometimes described as a Bacchanalian Revelry, and maybe it is. The Roman God Bacchus would have loved the spectacle. And I suspect most Burners would have liked him. Nobody could throw a better party than the God of Wine. But Bacchus had other traits Burners could agree with as well. 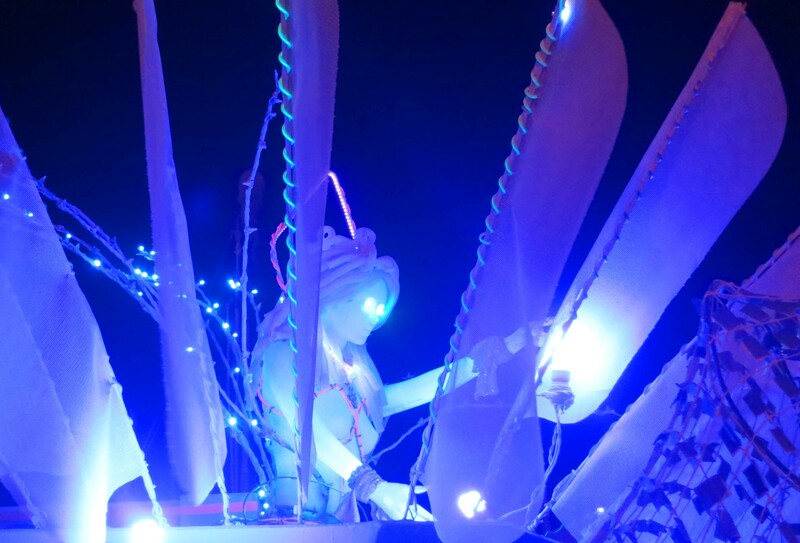 In his Greek Dionysian persona he was considered a “protector of those who do not belong to conventional society,” a phrase that might describe a significant number of those who make the trek to Black Rock City. The Romans believed that his wine, music and ecstatic dance freed his followers from fear and cares– and lessened the power of those who sought control over their lives. Besides the huge party and celebration that take place on Saturday night, there are also ritualistic aspects to the evening. 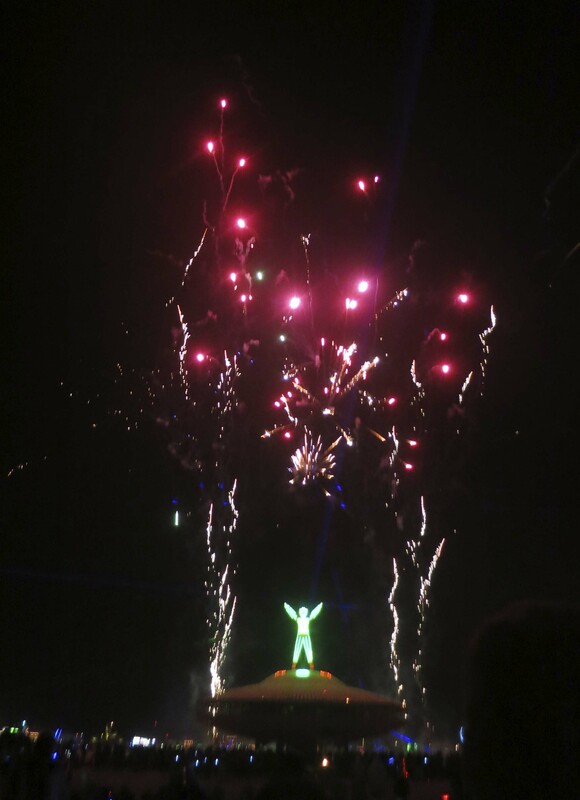 The Burning Man represents the end of the week and the end of his “life.” The Man’s week of dominating Black Rock City is over. Burners go silent just before he tumbles into his fiery grave, the music stops, and the dancers cease their gyrations. A huge shout accompanies his fall. The ashes have hardly cooled and been scooped up off the desert floor when planning starts for next year’s burn. Like the Phoenix, the Man will rise again. I spend my night of the burn making a full circle of the Man and doing what I do best, wander. I have sat and watched the show of fire dancers but my body has no tolerance for sitting in the dirt for two hours. It never has. Also, I don’t like being hemmed in. And finally, people can be rude. Late-comers occasionally try to force their way to the front. But the primary reason I wander is that I love the show on the outer two circles. The costumes are fantastic, the dancing wild, and the mutant vehicles magnificent. The total walk may be two miles in length and I make an evening of it. I will feature the walk on this blog and the actual burn in the next. The short video below captures some of the action on my walk. While I love the costumes and action, the mutant vehicles are the main attraction on my two-hour stroll around the Man. The night of the Burn is the only time you will find them all in the same place. This one has chosen a tropical setting. …and on this segmented mutant vehicle. 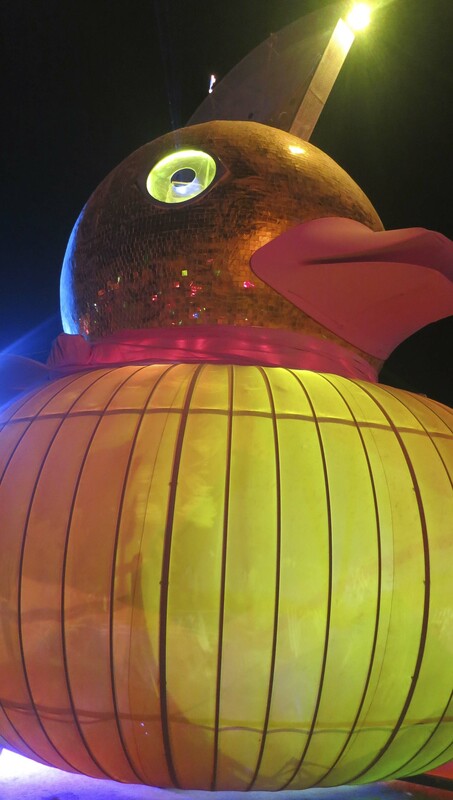 Many of the mutant vehicles, such as this duck, shoot fire into the air. The light can be blinding, and hot. I took this shot as El Pulpo Mechanico was shooting flames from his eight legs and head. Speaking of El Pulpo, he featured this fish on his side. The detailed work that goes into creating mutant vehicles can be incredible. This blue lady with her flashing eyes caught my attention. As did this strange horned creature. Music was everywhere. 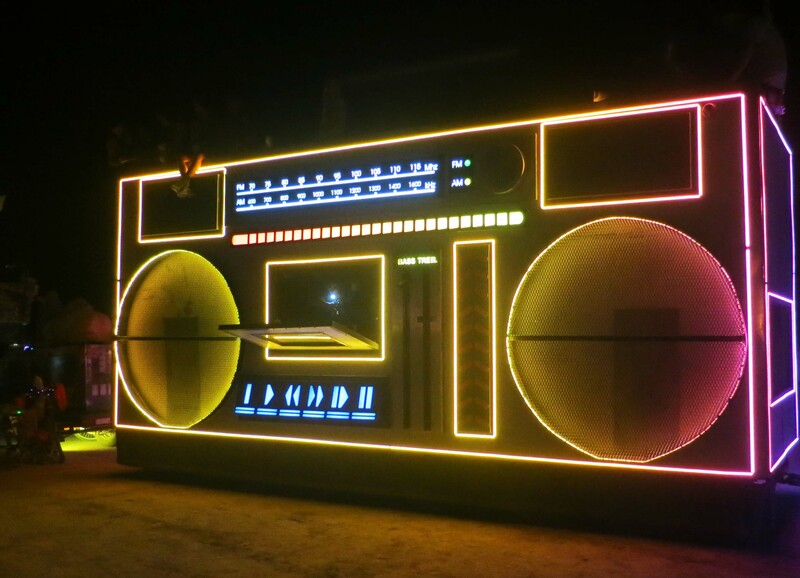 This mutant vehicle boom box was booming. BTW, I saw on Craig’s list where it was for sale. Some mutant vehicles bring their own live bands. A hundred or so Burners were dancing in front of this one. I could barely make my way through the gyrating bodies, so I danced my way through. Mutant vehicles provide prime viewing opportunities for the theme camps that build them. NEXT BLOG: The man’s arms are raised; it’s time for the burn. 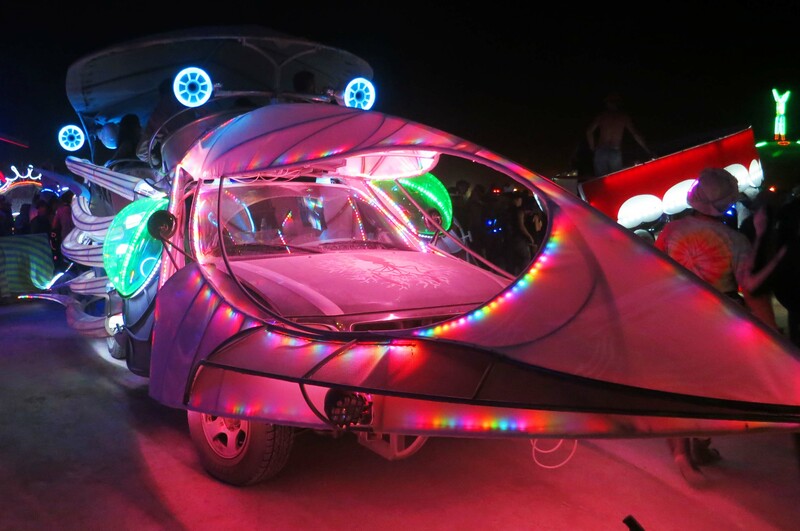 The Cat Car is a wonderful example of how creative people are at Burning Man in designing mutant vehicles and how much time, money and effort goes into the project. 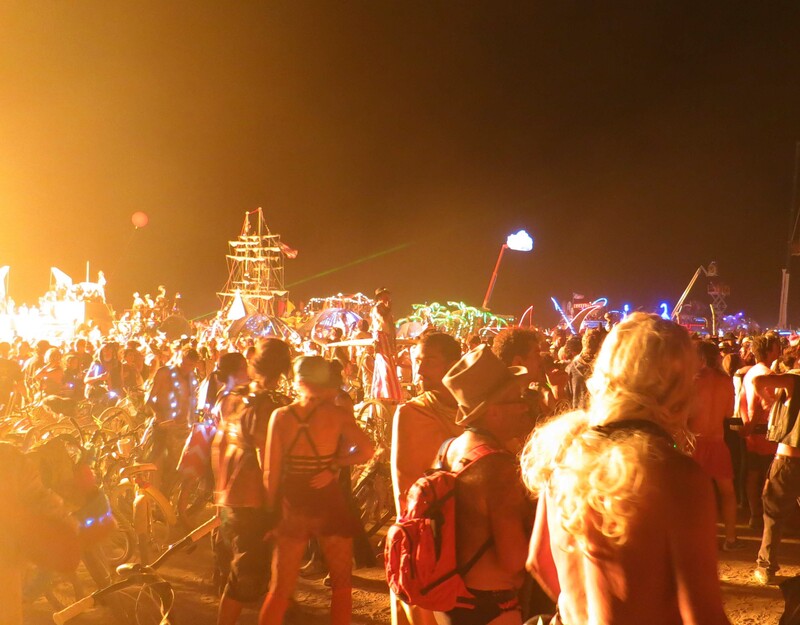 Driving your car around Burning Man is a definite no-no, unless of course you check in at DMV and obtain a permit. That’s the Department of Mutant Vehicles not the Department of Motor Vehicles. My first acquaintance with mutants was Godzilla. Today we have the Xmen but I am still partial to the early Japanese horror flicks. There was something totally campy about them that is rarely matched in today’s standard fare of special effects. 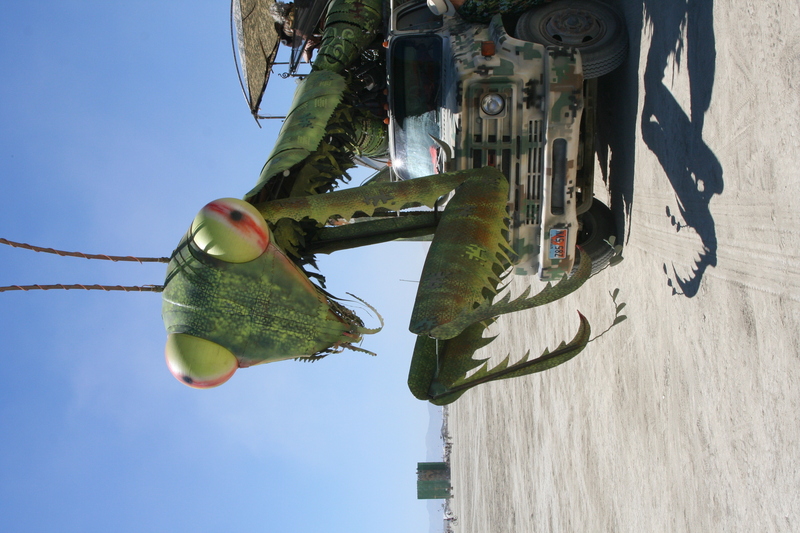 I wouldn’t describe Burning Man’s mutant vehicles as campy but they are wonderfully creative. 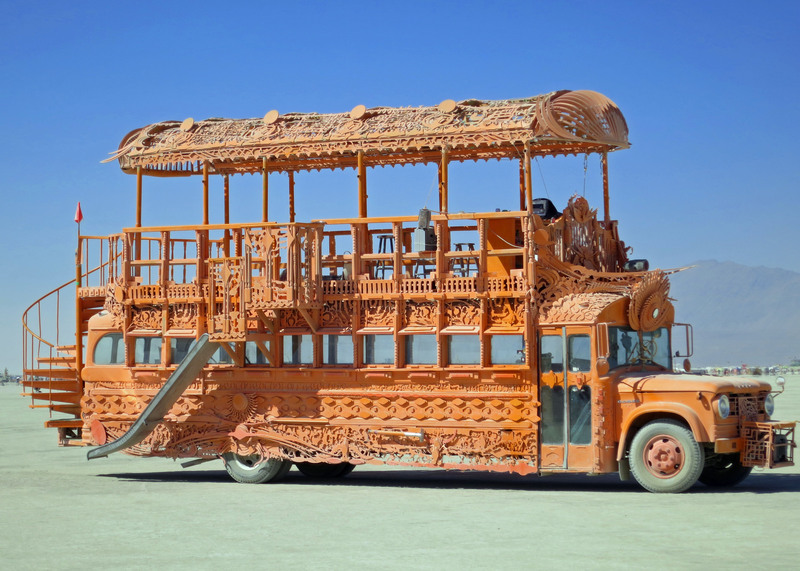 The rule is that if you are going to drive a vehicle at Burning Man it has to be decorated, i.e. transformed into something that has minimal resemblance to its original look. Check out the Cat Car above. And here again there is a movie reference since we have Transformers, the vehicles that morph before our very eyes. 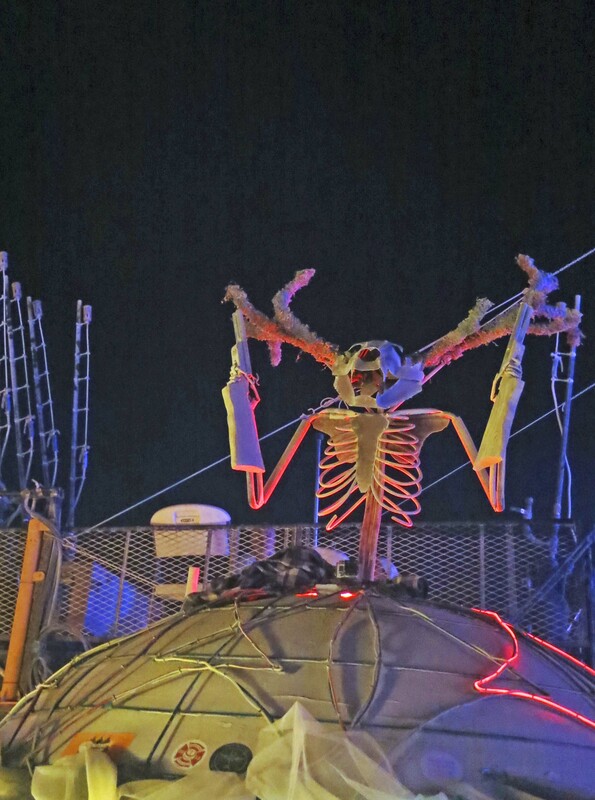 The mutant vehicles at Burning Man don’t actually morph but their persona does change between day and night when the already interesting dragons, bugs, elephants and ships are lit up like Christmas Trees and begin to breathe fire. It’s a transformation that is rarely if ever matched in our everyday world and I am still not sure whether it resembles a Fairy Land Fantasy or something out of Dante. Mutant vehicles of the day take on a different persona at night. Photo by Tom Lovering. Like my blog on the characters and costumes of Burning Man, this blog is better told with photos than words, however. The "Never Was Haul" is another great example of the creativity, work, and expense that goes into creating mutant vehicles. This one is delivered by flat bed to Burning Man. Photo by Tom Lovering. How often do you meet up with a polar bear in the desert? Photo by Tom Lovering. And here we have a golden dragon. (Dragons are common at BM.) Many of the vehicles are designed to carry a number of people. The woman dancing at the left is probably responding to music coming from the vehicle, another common occurrence. Mutant vehicles are also designed for individual use. While not defined as mutant vehicles and not requiring permits, many thousand bicycles are also decorated. 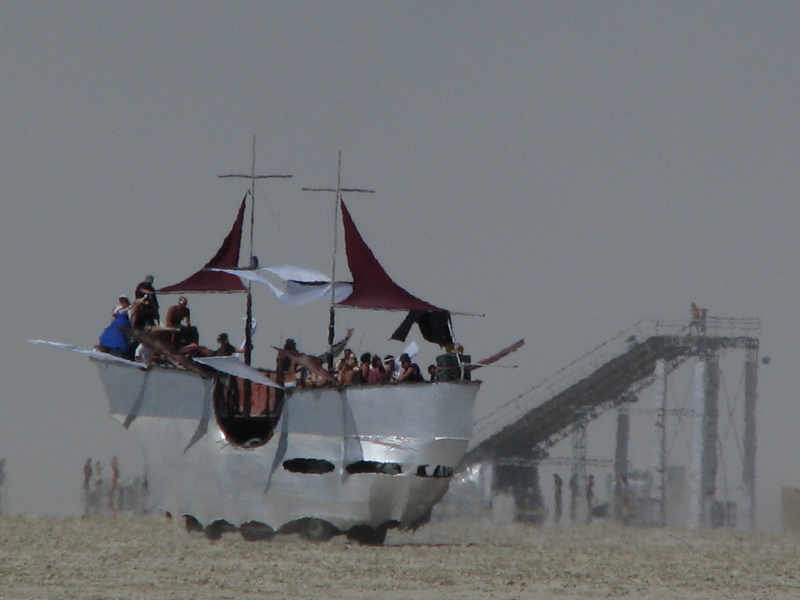 This ship of the desert captured by Don Green reflects both the heat and dust of BM. Note the giant slide in the background. Often mutant vehicles reflect a sense of humor. 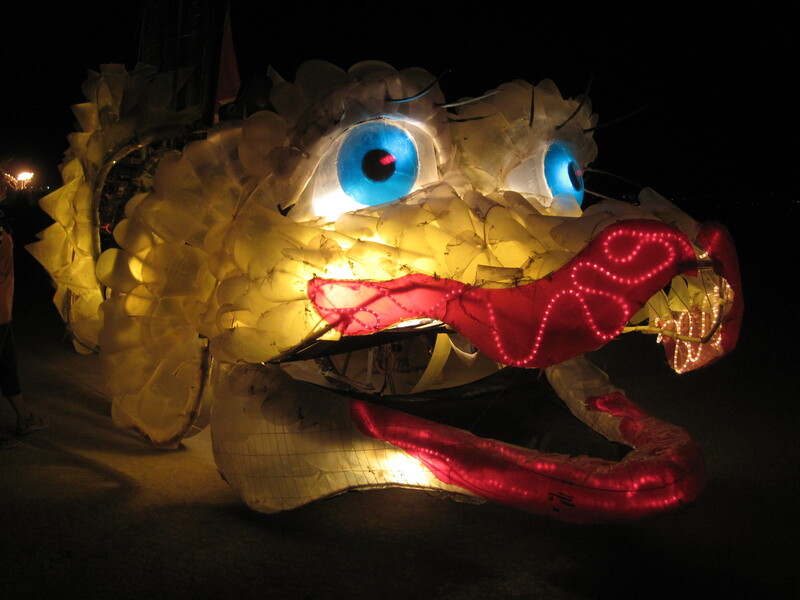 Or, like this dragon headed vehicle, may appear a little scary. The gun-like device on top shoots out flames at night. Tom Lovering caught this interesting vehicle as it drove by the Horse-Bone Camp. And that’s it for the mutant vehicles. I don’t have a clue as to how many are registered in any year, but they have to be in the hundreds. In the last photo, Luna, AKA Peggy, tries to hitch a ride. 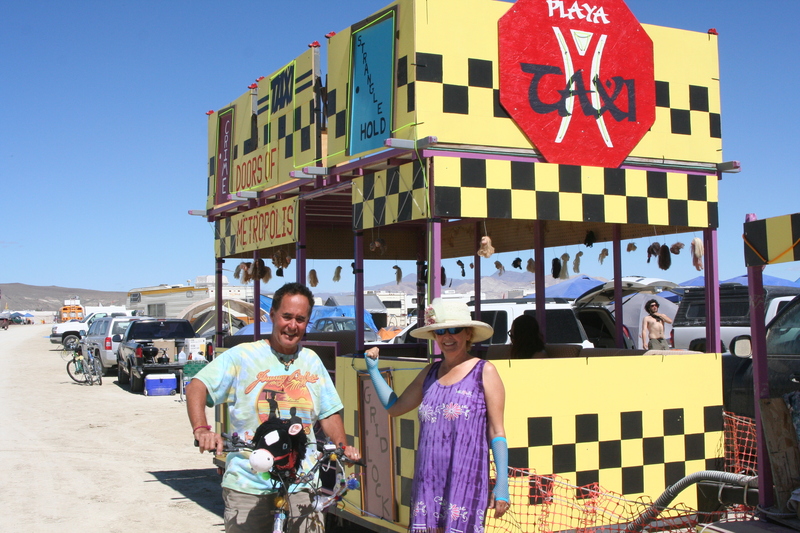 Sailor Boy and Luna of Horse-Bone Camp stop to check out a mutant vehicle masquerading as a Playa Taxi.